It’s not exaggerated to say that every Japanese has dreamt if he or she had Doraemon. Doraemon is a robot cat character from manga, anime and movie series “Doraemon” created by Fujiko F. Fujio and Fujiko A. Fujio. What so special about this robot cat is that he is from the 22nd century to aid this schoolboy Nobita with many gadgets and tools from the future. Usually they are in his forth-dimensional pocket, which is attached on his belly but when Nobita needs some help, Doraemon takes out a right future tool to help him. For example, the popular ones are “anywhere door” and “small light”. “Anywhere door” allows you to go anywhere you want! And “small light” is like a flash light and it shrinks anything includes human. 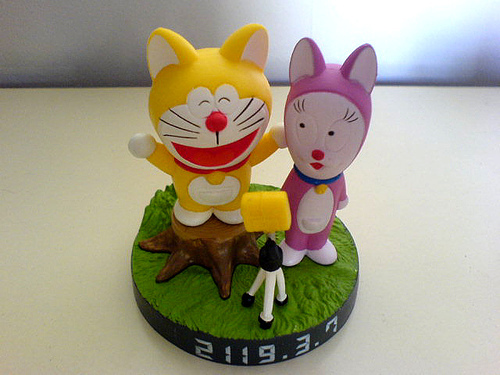 There are over 2100 future tools that Doraemon showed so far in manga, anime and movie. 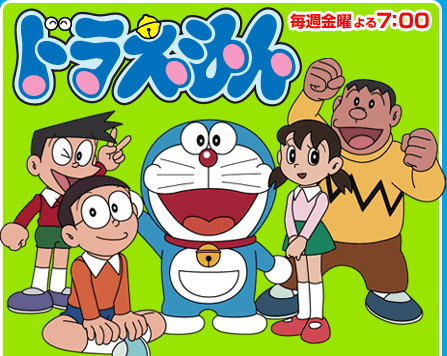 By the way, can you tell why Doraemon doesn’t have ears like a cat? He actually did have ears before he came to the past. What happened to him is that his ears were bitten by a mouse. Since then he gets panic when he hears or sees a mouse. And funnier thing is, his color was originally yellow but because he was so shocked about his ears eaten, he cried and cried the plating came off and turned into blue! !